We are almost done with our annual haul out and we are ready for what is shaping up to be a busy fishing season. A haul out is a where we actually take the charter boat Intimidator out of the water for scheduled maintenence and any necessary repairs. This is not exactly the most fun time in the world for a captain and crew but everyone knows as soon as we are done with the work at Dog River Marina, the sooner we can get back to deep sea fishing. We are lucky to have a good facility close by that can help us with any necessary issues that should arise. Once the boat is out of the water the bottom is soda blasted to remove all the slime, barnacles and anything else that doesn’t need to be there. Soda blasting is a process similar to sanding the bottom with 60 grit sandpaper. It uses a high pressure sprayer that shoots a combination water and soda at the same time and does a great job. 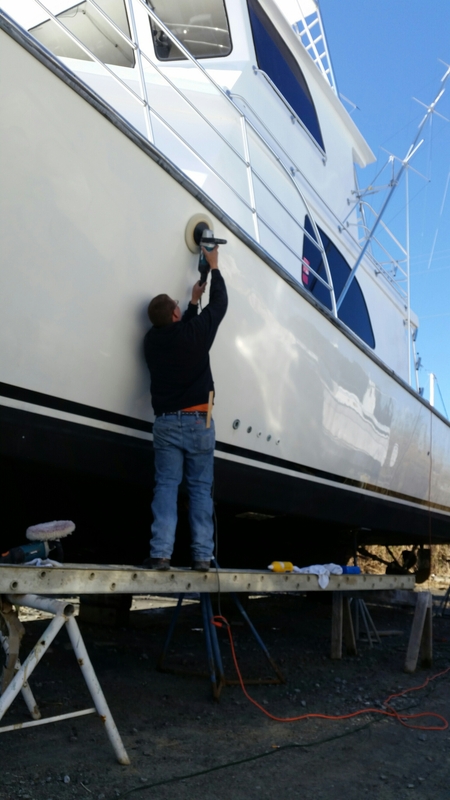 Once the bottom is clean then we compound and wax the hull sides with a 3M rubbing compound, then we come back and hand wax with a 3M cleaner wax to help protect the paint. We will normally put 3 coats of wax on the boat after that and so far the Rejex wax made by Corrision X company. I have two through hulls that are going to be replaced, one for the watermaker, and one for an underwater light. I have to admit I haven’t had much luck at all with Aqualights underwater lights but we are going to try yet again. After all that is done it takes 5 gallons of MarPro ablative marine bottom paint, new zincs we will be done! Now, hauling a 90,000 charter boat out of the water is not something that every charter business does every year but we are going to make sure everything is in top notch shape for the coming fishing season. This is not cheap as you can imigaine in fact it may even seem insignificant to some anglers but their is no way to put a price on piece of mind for me. It is yet another way to make sure there are no issues on the day when your fishing trip is here. Just remember that the crew you meet on the day of you charter fishing trip are the same guys that have spent countless hours of working on the boat over the winter to make sure everything is done right. No one bought a boat for us or handed over the keys to us, we earn it everyday. When it comes time to choose a charter, think about that. « What is a Full day trip to you?